Edition: 1st ed - may be Reissue. In 1989 the Supreme Court ruled that the State of Wisconsin was not liable for the brutal beating of a young boy by his father, who had been investigated by the Department of Social Services. In DeShaney v. Winnebago County Department of Social Services, Chief Justice William Rehnquist's majority opinion rejected the claim of the boy's mother that her son had been deprived of his constitutional "right to life." Taking the DeShaney case as her point of departure, Elizabeth Bussiere observes that the idea of a constitutional right to life was first rejected not by the conservative Rehnquist Court but by the liberal Warren Court twenty years earlier. 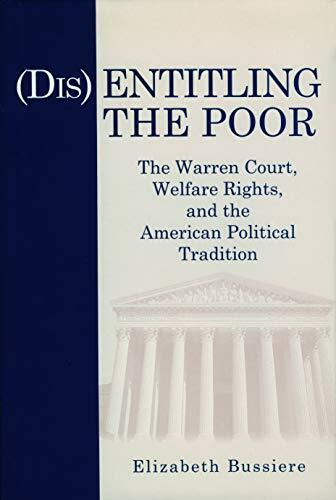 She investigates why the Warren Court, despite its many rulings "entitling" the poor to constitutional protections, refused to identify welfare benefits (or subsistence) as a constitutional right. Although focused on the Warren Court, the book explores Western political thought from the seventeenth through late twentieth centuries, draws on American social history from the Age of Jackson through the civil rights era of the 1960s, and utilizes current analytic methods, particularly the "new institutionalism."